WooHoo! I finished my Yellow Circle Quilt today!! I am thrilled it turned out as good as it did ~ thanks to all the many, many tutorials I read and watched online. The modern quilt thing ~ to me ~ is all about the internet. It would have taken me years to learn by trial and error what I just learned in two weeks while making this quilt. For squaring up quilts I followed this blogpost by Naptime Quilter. 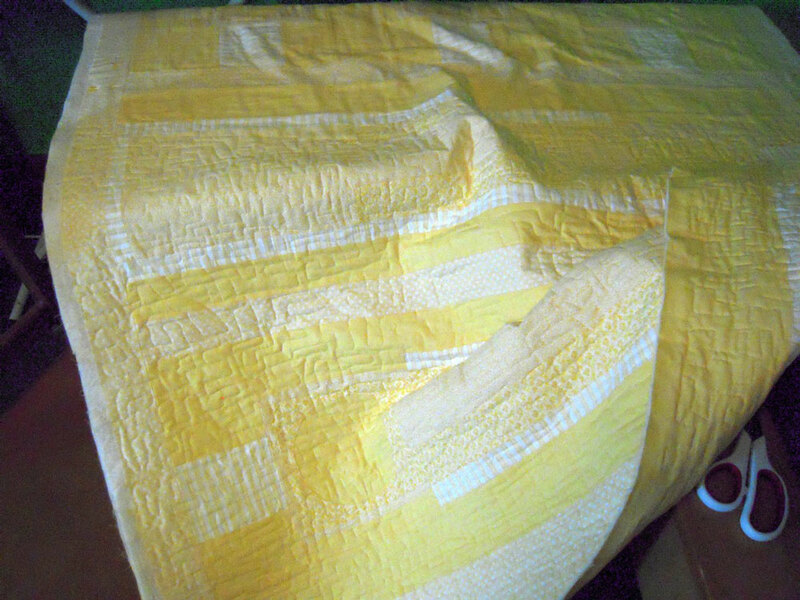 Then I spray basted my quilt. I didn’t see any tutorials the way I ended up doing it… I used the same technique we use when spray gluing paper, I will do a little tutorial myself here in few days to show you, because it worked out so fantastically I’m never using pins again!! Yep! I got a nice darning foot and walking foot, and a cover for the feed dogs… and holy crap what a difference it makes! So I practiced a few different free motion patterns and decided on one and got to town. I love the way the internet has completely enhanced my crafty life! Your quilt turned out beautifully. nice! this is so exciting!